The following are some of the many activities available for visitors to Krakow and Southern Poland, whatever your interest Krakow Tours can assist with all necessary arrangements to make your visit a great experience. 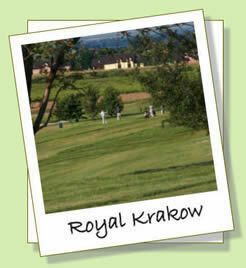 Whilst being very new and small scale in Poland, Krakow boasts 2 good golf courses. Krakow Valley Golf Club has an excellent 18 hole course which hosted the Polish Seniors championship in 2008, a PGA Seniors Tour event won by Ian Woosnam. The Royal Krakow Golf Club is a 9 hole course, which is as close as you'll ever find to a links course 375 miles from the nearest sea. Both courses have all the facilities you'd expect at a quality course, in the case of Krakow Valley, there is much more too; hotel, restaurant, horse riding, ski slope and even a shooting range. You can stay onsite to get the best of all the facilities, or stay in Krakow for the legendary nightlife. 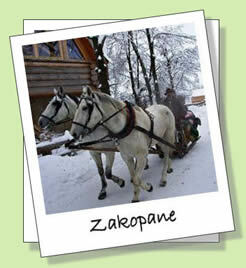 Whichever you preference KRAKOW TOURS will make all the arrangements for you. Krakow is surronded by some of the most beautiful countryside in Europe, ideal for both cycling and walking enthusiasts. The Ojcow national park is a spectacular example of the available contryside, 100km of walking or cycling trails, ranging from easy to strenuous you'll see castles, caves, forests and many different varieties of flora, fauna and wildlife. 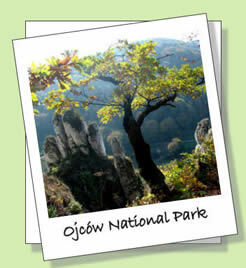 The Ojcow park also links into the 'Eagles Nest' region, which is a forest linking Krakow to Częstochowa 160kms away. As with all activity trips KRAKOW TOURS can provide all the necessary equipment for your holiday, if you don't want to bring your own bike - No Problem we'll arrange something suitable for you, just let us know what you require before your trip and it will be ready and waiting on your arrival..
From the First of December each year, the Rynek Głowny (Main Square) is home to a huge Christmas Market, that rivals any of the other markets around Europe. Perhaps the best thing about it is all the hearty Polish food and drink: steaming mulled wine (Grzaniec galicyjski), hot sausages, and interesting specialities such as fried oscypek cheese. Follow your nose and you'll sniff out all the best treats. 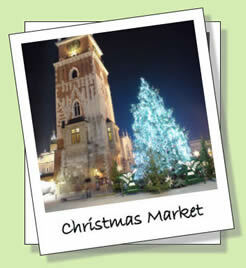 No need to limit your shopping trip solely to December however, Krakow is a great shopping location all year round. Similar to golf, Rugby Union is not a massive sport in Poland, but Krakow does have one of the 8 semi-pro teams that make up the Polish Ekstraliga (Premier League). They would provide good competition for many UK based county league sides. The main event of any good tour however is certainly the social side, at this the guys at 'Juvenia Kraków' are certainly experts in their field, coupled with the fantastic nightlife available in Krakow a tour here is certainly one to remember. We'll arrange all the accomodation, fixtures, transport and nightlife required, all you have to do is turn up and play or not as the case maybe. 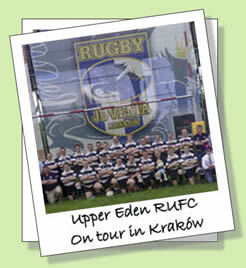 With many years of experience in touring and arranging rugby trips, we at Krakow Tours know exactly what is required for a successful tour. Krakow has 2 teams in the top flight of Polish football, 'Wisla Krakow' are riding high at the top of The league, whilst 'Cracovia' are strugglling near the bottom. Football fans wishing to watch a game here in Poland will be amazed at the passion of the Polish fans, and the Krakow derby is an incredible event. 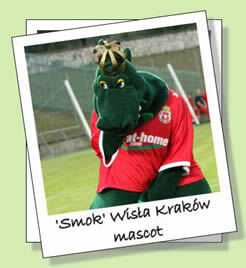 Poland will be one of the co-host nations for the 2012 European championships, unfortunately Krakow hasn't been awarded any games apart from in a reserve capacity, but trips are available to matches in Warsaw, Wroclaw, Gdansk and Poznan. KRAKOW TOURS will arrange your match tickets, travel to and from the game, and of course everything else to make your trip an enjoyable one. There are a few options available for skiers or 'would be' skiers, close to Krakow are many small slopes, some with snow cannons, these are ideal for a beginner to get a first taste of skiing, or maybe a regular skier wishing to try snow boarding. For more experienced skiers or more adventurous beginers, within an hour and a half we can have you at the top of some reasonable pistes, ideal for a day or half day skiing. If you have more time to spare and prefer a wider selection of pistes Krakow is little more than 2 hours away from The Tatra mountains and their extensive ski areas most famous being Zakopane. Whatever your preference KRAKOW TOURS can make all necessary arrangements to ensure you get the most of your trip. There are lots more activities available in the region, if you have any specific ideas or requests email us the details and we can make all arrangements for you.